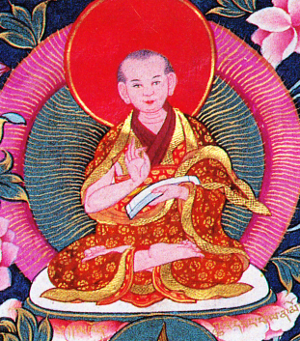 Khön Nagendrarakshita (Tib. འཁོན་ཀླུའི་དབང་པོ་སྲུང་བ་, Khön Lü'i Wangpo Sungwa; Wyl. ‘khon klu’i dbang po srung ba) — a disciple of Guru Rinpoche and one of the first seven monks ordained in Tibet—the so called 'seven men to be tested.' Together with his younger brother Ratnavajra, he received teachings on Vajrakilaya and Yangdak Heruka, and by practising them, attained signs of realization. This page was last edited on 8 February 2017, at 07:03.